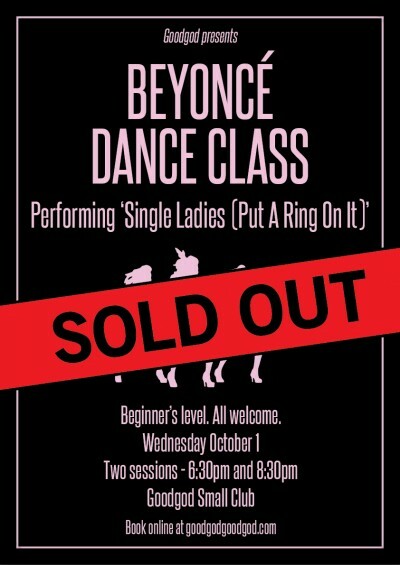 After a huge, sold-out debut, we’re bringing back the Beyonce Dance Class, performing “Single Ladies (Put A Ring On It)”! In a specially tailored nightclub class for beginners, instructor extraordinaire Amrita Tennant will guide you through an hour of Queen B! Get loose, win cocktail jugs, and learn some classic moves! This time, we’re running two classes… but they’ll be a little smaller than last time for maximum dance space! Don’t delay – grab your friends and book tickets, these WILL sell out. For info on the earlier session, click here.